A synonym for happiness, Dafna Maimon's new solo-show is comprised of a video installation and two sculptures. As an entry-point, Maimon incorporates the idea of the Big Dumb Object; science fiction's absurd extension of the Hitchcockian MacGuffin. These Big Dumb Objects (or BDOs) are omnipresent in the sci-fi genre in a myriad of forms – man-eating plants, aliens, giant subterranean worms, etc. – and function as a plot tool while simultaneously physicalizing the complex anxieties and feelings of helplessness that compose the modern human condition. The resulting interactions between characters in these films and the BDOs are representative of the emotional undercurrents that we all face as we search for meaning and purpose in our day to day existence. The sculpture works in Can't Complain are direct descendants of BDOs, encapsulating their absurd power as psychological objects that manifest desire and anxiety. When placed in the gallery setting, however, far removed from ties to narrative fiction, the fear and awe that these objects instil within the context of a film becomes ridiculous and twisted; we are incapable of associating our own anxieties with these objects, finding that, as Hitchock explained, "… a MacGuffin is nothing at all." Alongside the sculpture works is a new video piece, centred around a couple struggling to keep their relationship alive in the midst of a complete breakdown of their physical and emotional lives. Employing the melodramatic tendencies of B-movie culture to showcase the deterioration of an already depraved relationship, Maimon explores the notions of motivation and choice on a minute and absurdist scale. In a manner not dissimilar from the characters in sci-fi films who must contend with new, unexplainable forces in their lives, the couple tries in vain to understand the meaning and source of their current state– mid-kiss, they find themselves asking, "Why are we doing this? What are these noises?" 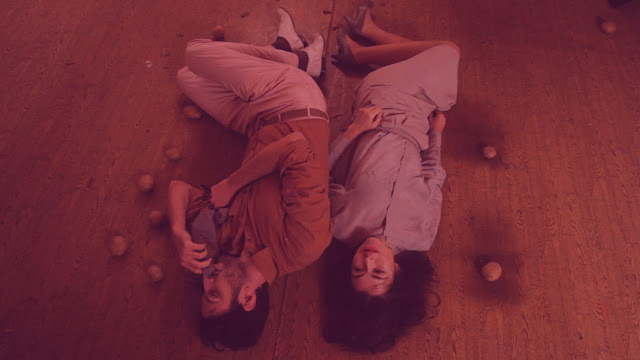 The performative aspect of the lovers' relationship is augmented by the incessant appearance of titles and crew members in the video. Though the characters are not aware of their place within the bounds of the film, their sincerity is put into question, suggesting that they are playing out a learned expectation of love. As Barthes wrote in A Lover's Discourse, "… by a specifically amorous perversion, it is love the subject loves, not the object." The resulting dialectic is one that treads the line between fact and fiction, exploring questions about the nature of human relationships as the couple oscillates between disturbingly passionate outbursts of mutual desire and Sisyphean squabbles. The helplessness that the couple feels is made physical in the sculpture works, combining the force of the Big Dumb Object with a physical symbolism that harkens back to Sisyphus' rock; that ultimate representation of the futile nature of human existence. Angelika Götz is a stylist and costume designer for featured films and commercials based in Berlin. Intent on creating feeling and atmosphere in images, Angelika brings her particular sensibility to the picture. Her background includes a degree and work experience as a psychologist. She is trained in original costume design and construction. Her extensive specialist knowledge of period costumes is based on lectures of fashion historians Gundula Wolter and Valerie Steele and designer Vivienne Westwood. In 2002 she started working for the avantgarde fashion label BLESS in Berlin and Paris. Since 2006 Angelika works as a stylist for magazine work and commercials and shot her first feature film "Lost Place" in 2011 . In 2016 she stared working on the first 6 parts of swiss tv series "wilder".